Gary Pollack was born in San Francisco, CA and raised in Daly City, CA, by his grandparents, Harry and Natalie Pollack. Gary’s grandparents owned a Dry Cleaning business where Gary worked as a young boy daily after school. In his early teens, Gary also worked at a bowling alley repairing the pinsetter machines and doing maintenance yet always had an interest in cars and mechanics. He found himself hanging out at garages where his older friends worked on cars. Observing their every move, Gary began learning exactly what made these cars tick. He could only dream of actually having a garage of his own. Gary attended Westmoor High School where he focused his studies on auto mechanics. Fresh out of high school he married and became the father of two boys, Bret & Brandon. Working two and sometimes three jobs to support his wife and boys, Gary did whatever it took to put food on the table. He worked as a plumber by day and drove a tow truck at night. As years passed, Gary got involved in the piano moving business and later owned his own retail piano stores. The dream he had as a young boy to have his own garage and work on cars stayed fresh in his mind. One day, he only hoped to make this dream a reality. In 1990, Gary founded “Gary Pollack Construction & Excavation,” which has built a reputation as a leader in Excavation, Drainage, Drilling, Demolition and Trucking services in the San Francisco Bay Area. Working 12-16 hours days for years dedicating his knowledge and expertise to his clients, Gary has earned this reputation. In 2008, Gary was at a point in his life where his childhood dream was about to become a reality. 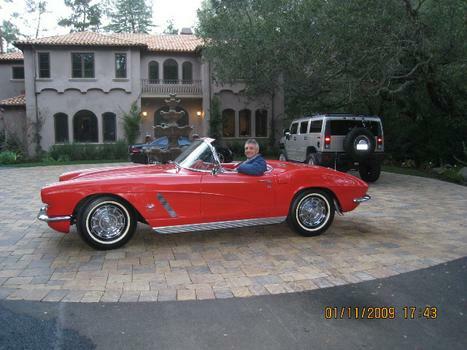 He started attending various car shows and auctions throughout California and educated himself on classic cars. He purchased his first car in 2009 on eBay. It was a 1965 Pontiac GTO convertible, similar to the first car Gary ever owned. He flew to Ontario, and then drove to Temecula, CA to pick it up. Realizing this dream was finally becoming a reality, Gary obtained his automobile dealers license and continued purchasing classic cars, each one more collectible in its own way and storing them in various locations. In 2011, he purchased a warehouse in San Carlos, CA, which he initially called his “Mancave.” The Mancave was later given the name “The Great Highway,” Home of Gary Pollack Classic Cars, as this was reminiscent of a boulevard in San Francisco where Gary and his friends raced on weekends as young men. Spending his nights and weekends dedicated to building his dream and recreating the 1950’s, 1960’s and 1970’s, in December, 2011, what was once a dream of a lifetime became a reality. The Great Highway was born! Hi Nick! Would love to see you! Please call me at 408.250.4366. Hope to hear from you soon!